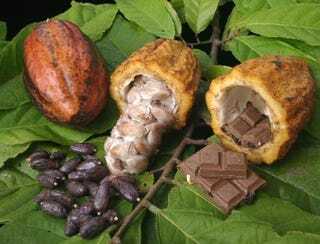 The chocolate tree genome has just been sequenced, revealing which genes are responsible for turning ordinary cacao crops into the finest chocolate. Now a little careful genetic tweaking could produce tastier, healthier, and more environmentally and economically beneficial chocolate. The particular type of chocolate genome that was sequenced was a variety Theobroma cacao known as Criollo, a crop domesticated by the Maya some 3,000 years ago and widely considered the source of the world's best chocolate. The problem with this particular crop is that it's very susceptible to disease and tends to produce smaller yields, which has forced many farmers to use hybrid cacao crops that produce more plentiful but lower quality chocolate. "Our analysis of the Criollo genome has uncovered the genetic basis of pathways leading to the most important quality traits of chocolate — oil, flavonoid and terpene biosynthesis. It has also led to the discovery of hundreds of genes potentially involved in pathogen resistance, all of which can be used to accelerate the development of elite varieties of cacao in the future." There are good practical reasons to want to see more fine chocolate produced. Cacao farmers only earn on average about $2.00 per day, and switching to higher quality versions of chocolate would hopefully increase their income. Finding a way to grow Criollo and other high-end chocolate variants in a more efficient manner would also create a more sustainable chocolate economy, and the crops themselves have some positive environmental benefits because they grow best in shaded, forested environments. "Interestingly, only 20 percent of the genome was made up of transposable elements, one of the natural pathways through which genetic sequences change. They do this by moving around the chromosomes, changing the order of the genetic material. Smaller amounts of transposons than found in other plant species could lead to slower evolution of the chocolate plant, which was shown to have a relatively simple evolutionary history in terms of genome structure." Other cool findings include the genes responsible for cocoa butter, which is used not only in chocolate production but is also much sought after for pharmaceuticals and cosmetics. 84 genes out of about 30,000 control the amount and quality of cocoa butter in the cocoa beans. They also discovered genes that controlled, among other things, the hormones, pigments, and aromas making up chocolate. Tweaking any of these genes could help create chocolate that doesn't just smell and taste better, but is actually healthier.